Some parasites can manipulate their host's behaviour in very spectacular ways, but there are also other parasites that change their host's habits in more subtle manners. While such alteration to the host can seem fairly minor, they can still result in some very profound impact on the rest of the ecosystem. There is a group of parasitic barnacles call Rhizocephala (the most well-known species is Sacculina carcini) that are capable of castrating their host, turning them into unwitting babysitters that nurture the parasites' brood. The infected crab display some very obvious changes to their behaviour, and in some cases, their appearance. But the study we are featuring today shows that apart from turning them into doting mothers for the parasite's babies, these barnacles can also alter the crab's behaviour in less obvious ways that have ramifications for other marine inhabitants. The flatback mud crab (Eurypanopeus depressus) lives in estuaries on the coast of South Carolina and it is infected by a species of rhizocephalan call Loxothylacus panopei. In addition to doing the usual host castrating and commandeering trick, L. panopei also changes how this crab responds to potential prey. Usually, the mud crab has an omnivorous diet, dining on algae as well as worms, smaller crustaceans, and sponges. Sometimes they may also have a crack at more armoured prey like mussels. But crabs that are infected with L. panopei lose their appetite for such shell-covered fares. When researchers offered uninfected crabs with piles of mussels, the crabs acted like they were at an all-you-can-eat seafood buffet and ate as much as they can - the more mussels the researchers presented them with, the more they ate. But no matter how many mussels they offered to crabs that were infected with L. panopei, they simply eat one and call it a day. The parasitised crabs also took longer to get their act together and this seems to be related to the size of the crab's parasite - the larger the parasite has grown, the longer the crab takes to start digging into a mussel. 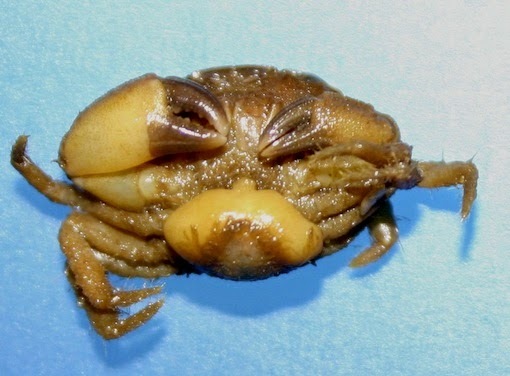 Based on a field survey of the estuary where the study took place, the researcher concluded that about a fifth of the crab at that location were infected with L. panopei. Given the effects that L. panopei has on their crab's appetite for shellfish, it seems that the mussels might have an unlikely ally in the form a parasitic barnacle. The finding of this study share some parallel to another paper that we featured on this blog earlier this year, on the muscle-wasting parasite that infects a predatory shrimp and curb its otherwise ravenous appetite. Ecosystems are made up of complicated networks of biological interactions and parasites can mediate predator-prey interactions in different, and sometimes conflicting ways. While some parasites can make prey animals more vulnerable or accessible to predators, there are other like L. panopei that may be reducing the appetite of the said predators. The subtle interplay of such parasite-mediated interactions are often overlooked or ignored, but their effects on the ecosystem are certainly there if you know what to look for. Toscano, B. J., Newsome, B., & Griffen, B. D. (2014). Parasite modification of predator functional response. Oecologia 175: 345-352. Parasitism is the most common mode of life on Earth and it can found everywhere, in all kinds of environments. Even in extreme places such deep sea hydrothermal vents, amidst hellish geysers pouring out hot sulfide or seeping methane, parasitism carries on as usual - the players may change, but the game stays the same. While on this blog most of the nematodes we have featured are the parasites, in this particular case, they play the role of the host. Laying about 85 kilometres off the coast of Oregon, under about half a mile (800 metres) of water is the Hydrate Ridge methane seeps. These vents are covered in mats of sulfide oxidizing bacteria which are crawling with worms - mostly nematodes from the genus Desmodora. One of these species happens to be a host to the parasite we are featuring today - Nematocenator marsiprofundi - which translates into "nematode eater of the deep sea". It is a microsporidian - a group of single-cell parasite somewhat related to fungi, and taxonomically speaking, N. marsiprofundi lies right near the base of the split between these two groups. Microsporidians are found in a wide range of animals including vertebrates such as fish and reptiles, as well as invertebrates such as insect, crustaceans, and nematode worms. 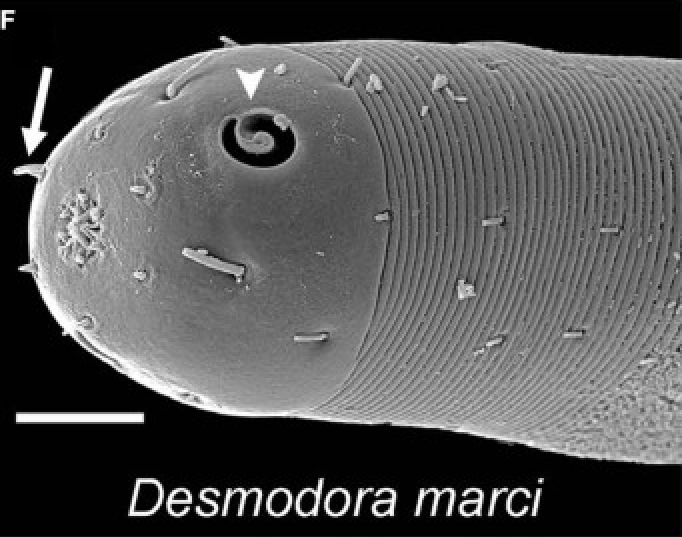 The host of N. marsiprofundi, a nematode named Desmodora marci (see above), is one of the more abundant animal at methane seeps. There can be as many as twenty worms for each millilitre of carbonate rocks from such locales, and over half of those worms would be infected with N. marsiprofundi. This parasite seems to be common at such vents and were found at sites which are 15 kilometres, so N. marsiprofundi is not localised to just a particular location and/or worm population. The spores of this parasite (see left) are mostly found in the worm's reproductive tract; in female worms, the spores sit in the uterus next to the eggs, and in the male, the spores lined the worm's sperm duct and cloaca. This led the researchers who found this parasite to suggest that N. marisprofundi is sexually transmitted between its host. However, they also noticed some stages of the parasite were situated in the body wall, where they seem to degrade and digest the worm's muscle tissue, not unlike the microsporidian we featured a two months ago which infects an amphipod that has become invasive in Central Europe. Studies like this shows parasites might be more common in the deep sea that we might have previously suspected, and that even in seemingly extreme environments like hydrothermal vents, there is good living to had as a parasite. Parasitism is everywhere on this planet, and while many people may think parasites are odd freaks of nature, in reality they are just a normal part of life on Earth. Sapir, A., Dillman, A. R., Connon, S. A., Grupe, B. M., Ingels, J., Mundo-Ocampo, M., Levin, L. A., Baldwin, J. G., Orphan, V. J. & Sternberg, P. W. (2014). 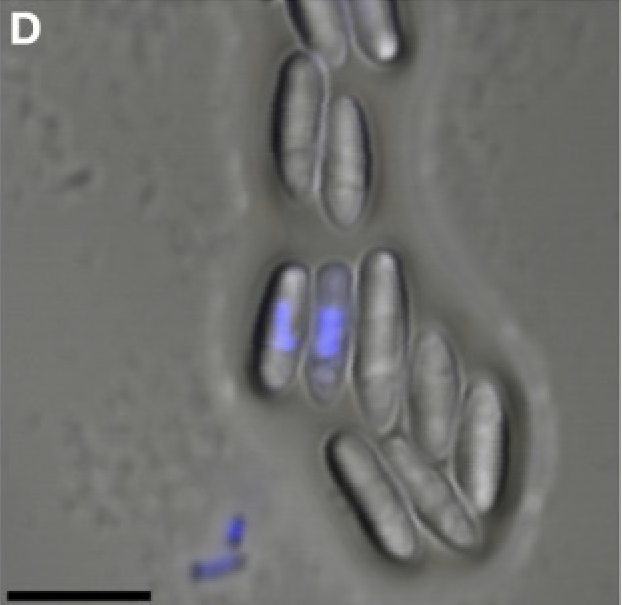 Microsporidia-nematode associations in methane seeps reveal basal fungal parasitism in the deep sea. Frontiers in Microbiology 5: 43.